A seasoned pastor, A.W. Tozer knew spiritual leadership as a grave task demanding great devotion and even greater dependence." 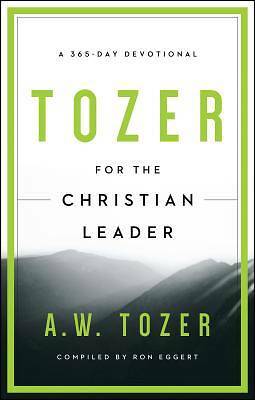 Tozer for the Christian Leader "makes him into a personal mentor. He says the hard things you need to hear with the severity they deserve. He warns, unveils, and convicts. He brings words of grace, encouragement, and comfort. He displays God's word in its full spectrum: as a sword and as bread. Ignore him and you forfeit the wealth of his wisdom for you. Plug your ears and you silence his word that instructs so highly. Read without action and you waste treasures given freely. Tozer will inspire you to work hard for God. He will call you to cultivate a Spirit-filled heart. He will urge you to have great faith-to see God big, pray expectantly, and worship fully. He will help you be a better leader, one fit for service to the Most High God. "These daily reflections grouped thematically by month are ideal readings for any Christian leader-pastor or otherwise. "